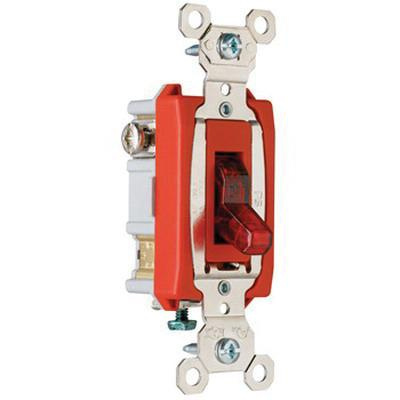 Pass & Seymour 1-Pole Extra heavy-duty pilot light switch in red color, is rated at 120-Volt AC and 20-Amps. It has maximum load capacity of 1 hp at 120-Volt AC and 2 hp at 240-Volt AC. This industrial specification grade switch features glass reinforced nylon back body. It measures 3.281-Inch x 1.32-Inch x 1.073-Inch. Snap action switch with back and side-wired connection, accommodates terminal of size 14 - 10-AWG. Locking support of this switch offers resistance to face and back body separation. Auto-ground clip ensures positive ground.